Triple-digit temps • Highs around 100 forecast for most of the week. Al Hartmann | The Salt LakeTribune Folks kick back beneath tree on the edge of the pond in Sugarhouse Park during the 100 degree heat July 4th before the start of the fireworks show tonight. Picnics, barbecues, pool parties and fireworks were on the minds of Salt Lake City residents this Fourth of July. With temperatures climbing toward a predicted high of 100 on Tuesday — in what is expected to be a week of high temperatures within a shout of the century mark — Salt Lakers sought out various ways to stay cool. Some ventured to Salt Lake County's public swimming pools, some of which were open for limited holiday runs. A few dozen swimmers took advantage of the indoor water features at Fairmont Aquatic Center before noon, while about three dozen were enjoying getting wet outside at Liberty Park Pool by 1 p.m.
"They'd rather be under the sun in the pool," said Alex Devow, 18, who was running the front desk Tuesday at the Fairmont center, which also oversees the Liberty Park pool operations. 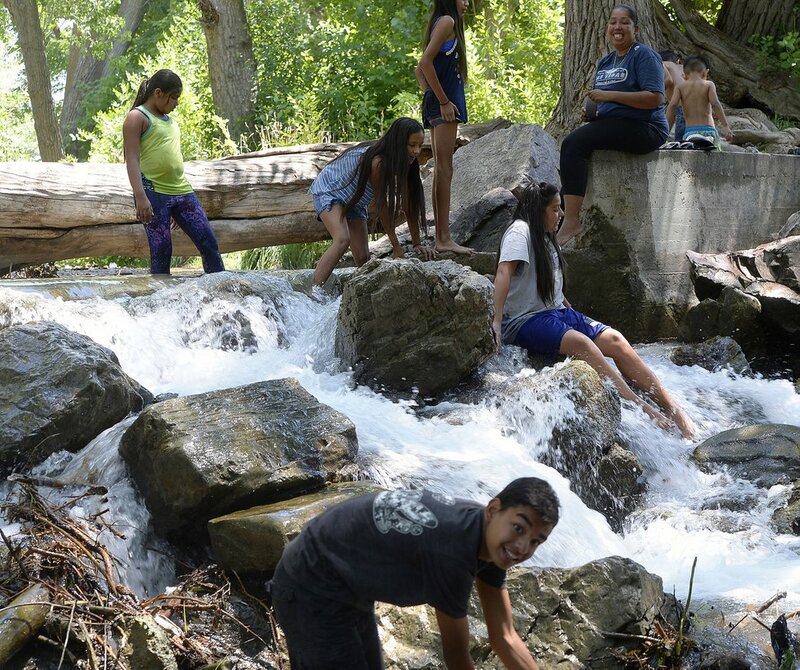 Olivia Robinson, 15, a soon-to-be-freshman at Copper Hills High School, wasn't getting in the water at Liberty Park, but her four younger siblings were. Robinson's strategy for staying cool: "Just sit in the shade and drink water." 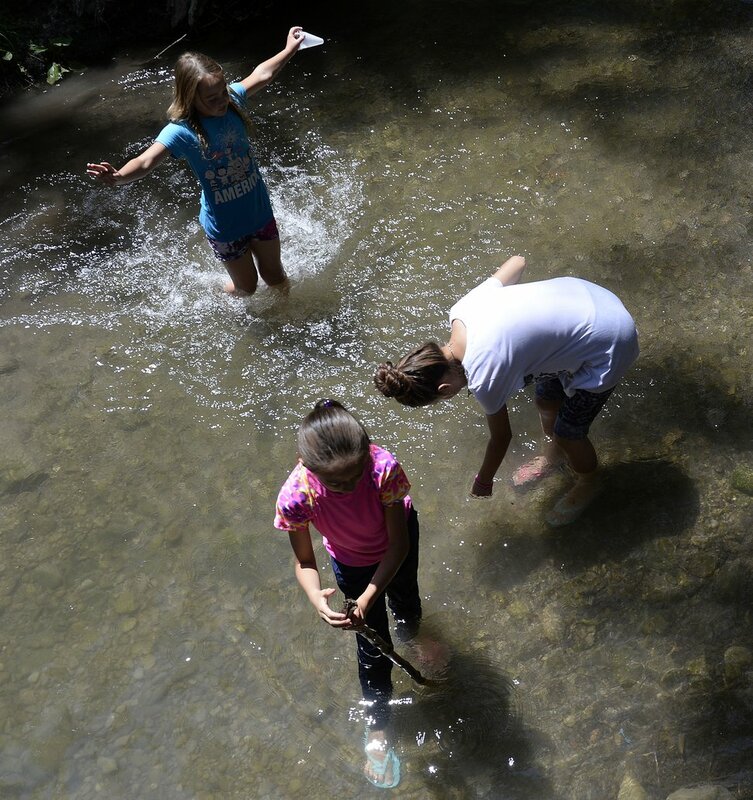 At Sugar House Park, people played in the creek to stay cool. Others staked out spots in the grass for the evening's fireworks spectacle and watched workers assemble the carnival midway rides that were set to open later in the afternoon. Andrew and Alex Belnap, of Orem, brought their 8-year-old daughter Addie for an overnight "staycation" — a Salt Lake Bees game Monday night (with fireworks), and Tuesday's events at Sugar House Park. "We came early so we could find shade," Andrew Belnap said, from the family's spot under a tree. The family had a stocked cooler, and a small tent in which to lie down. "And we're willing to get an Uber and take a break if we have to," he added. 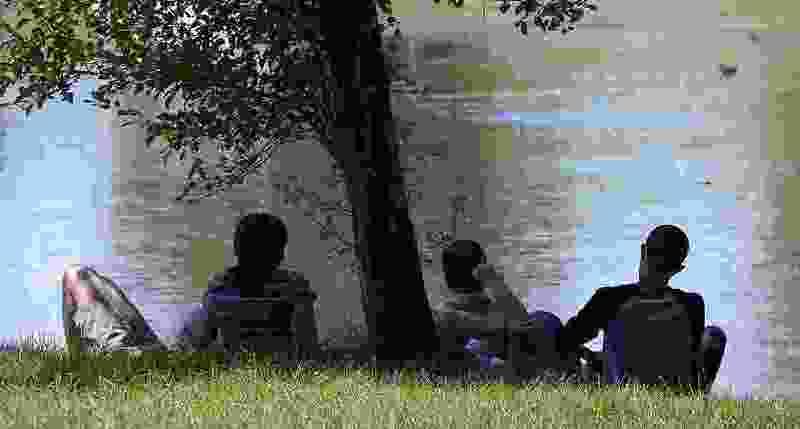 The National Weather Service predicted a high of 101 on Wednesday in Salt Lake City, 100 on Thursday, and in the upper 90s through the weekend. When it gets really hot, the Southwest Utah Public Health Department recommends people stay in air-conditioned places during the hottest part of the day, from 10 a.m. to 4 p.m. If people go outside, they should drink plenty of water, stay in shade when possible, apply sunscreen with an SPF of 15 or higher, and wear a hat and sunglasses. Salty snacks also are a good idea, to replenish sodium lost by sweating. Salt Lake County Adult and Aging Services maintains a directory of "Cool Zone" locations, where seniors and the disabled can take refuge from the heat. A list of locations — of libraries, recreation centers and the like — is available by calling 385-468-3200, or online at slco.org/aging-adult-services/cool-zone. 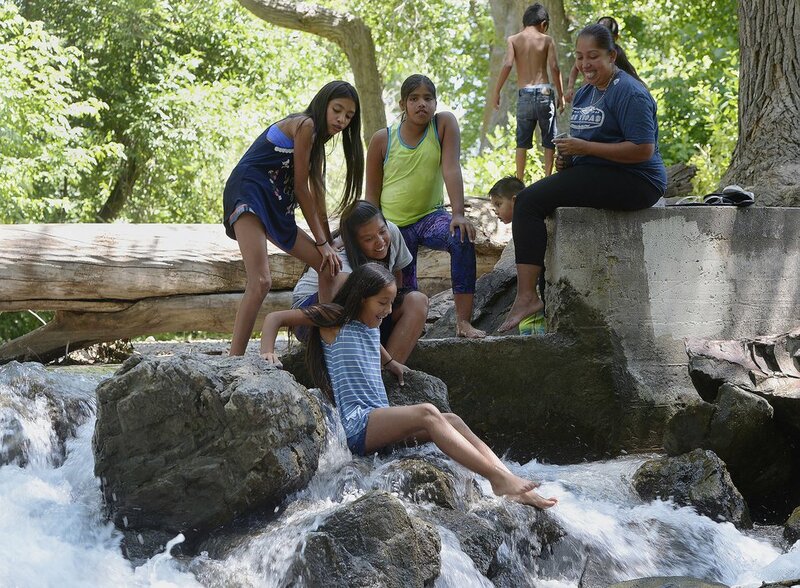 Al Hartmann | The Salt LakeTribune Children play in the cool water of Parley's Creek in Sugarhouse Park during the 100 degree heat July 4th, a good way to pass the afternoon before tonight's fireworks show. 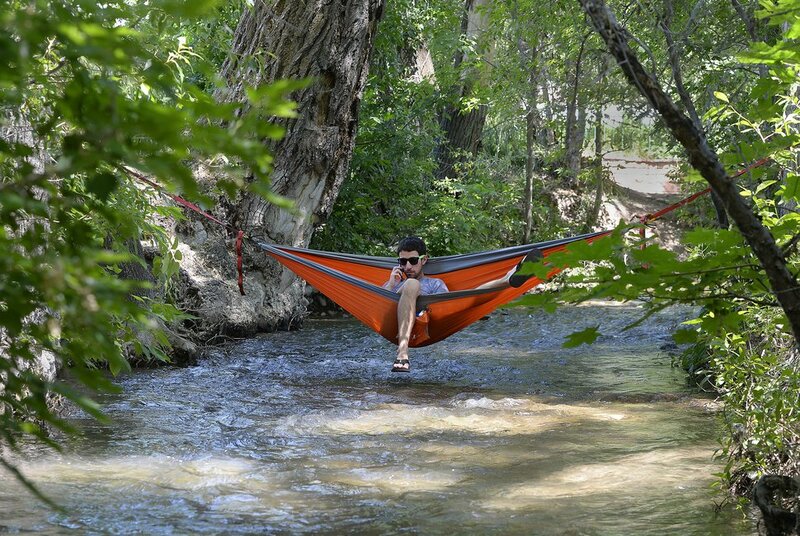 Al Hartmann | The Salt LakeTribune Man who wished to be unidentified finds some peace from the crowds and coolness from the 100 degree heat July 4th stretched across Parley's Creek in his hammock in Sugarhouse Park.